Apartments Alta are situated in a pleasant and central area of Puerto de la Cruz, just 200 metres from the beach and the ¨Lagos Martianez¨ and in front of the shoping complex. We offer you a stay with the maximum relax and confort. Our facilities are swimming pool, soalrium and bar with terrace. 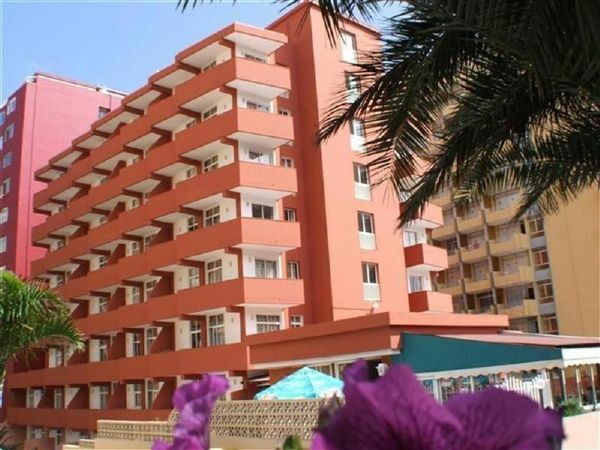 We offer 60 large and modern apartments, of either 1 or 2 bedrooms. The Apartments Alta are situated in Puerto de la Cruz in the north of the island of Tenerife, on the skirts on the Orotava Valley. The extraordinary climate of the Canary Islands is perfectly reflected in this Valley, cradle of the trade winds which provide it with smooth temperatures all year round. The Apartments Alta is a building situated in the touristic and commercial area, opposite a large shopping centre, less than 100 metres from the Martianez beach and pools. Puerto de la Cruz is a town with two mixing personalities: the identity of a fishing village and the cosmopolitan feeling which has provided it with its touristic identity since 1960. It has 41 one room apartments and 20 two room apartments, all with terrace. All the apartments have a sofa bed in the lounge. We also offer two suites on the top floor of the building, one with 2 bedrooms and the other with one bedroom and jacuzzi in the bathroom, both with noble wood furniture and spacious private solarium surrounding the suites. In the outdoor complex is a swimming pool, a sun terrace with sun loungers and parasols laid out ready for use and a pool/ snack bar. Sports enthusiasts may play tennis or billiards/ snooker.